Reducing our use of plastic is not easy. It requires a change in thinking and a change in our habits. But if this is something that you have long thought about, you are not alone. This change in lifestyle to eliminate plastic in our everyday life is shared by more and more consumers as we become more aware of its long–term impact on our global natural resources. Some local communities are making this shift as well. Starting in June 2019 the town of Lunenburg will eliminate bags from retail and grocery stores. Check out this article about it in the Sentinel & Enterprise. It is a noble cause to try to go completely plastic free, but many recognize that this is nearly impossible. There are many barriers: time, convenience, expense. Don’t be discouraged! The advice from experts is to make changes slowly by eliminating one item at a time. Of course, once you begin reducing your plastic use you will no doubt start to notice that plastic is everywhere. Again, don’t be dismayed! Remember: start small. We challenge you to join us all here at North County Land Trust, beginning this month of April, to eliminate one item of plastic each month. Together we can make a difference. Let’s begin with something simple: your toothbrush. Instead of the usual plastic one, trying purchasing one of the many available bamboo toothbrushes. While a plastic toothbrush will sit in a landfill forever and release toxic chemicals as it decays, a bamboo toothbrush will naturally decompose after it’s been disposed of. 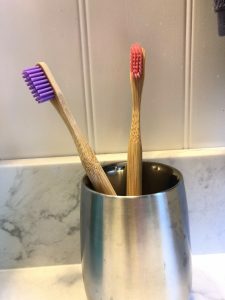 Bamboo toothbrushes are becoming more popular, and a variety of options can be found online and in stores in the area. You can also be intentional about your plastic use in your toothpaste. Although toothpaste tubes are typically not recyclable in your home recycling bin, you can bring them to drop-off locations through programs like TerraCycle, typically for free. Finally, consider swapping your dental floss for a compostable brand, or a brand that doesn’t use plastic for the packaging. Some companies also offer refillable glass containers for the floss. 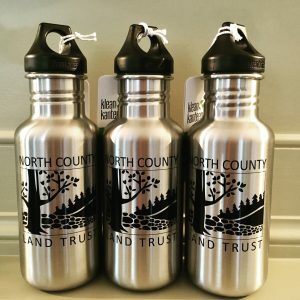 Did you know: If you become a member with a sustaining monthly donation of $10 or a one time donation of $120, you get a reusable metal water bottle (Great for reducing plastic water bottle use!). Check out our membership link at the top of the page for more information! Plastics are everywhere around us. But we can make a real difference by making changes in our lives to reduce our plastic use and by being aware of how many things we own with plastic components. We hope you will continue to follow along with us this year as we work to reduce plastics in our lives, one step at a time. Do you have questions or suggestions about how to reduce plastic? Engage with us on our Facebook post for this month’s topic.